Chris Desilets knew he was always destined to hold a leadership position, and he believes he is ready to lead the Class of 2017 as president. 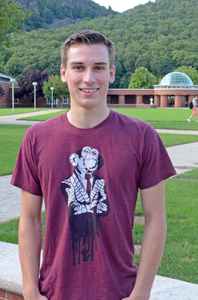 As an undecided business major from Upton, Mass., Desilets spent his time in high school devoted to the Distributive Education Clubs of America, as he was co-president for the state chapter. 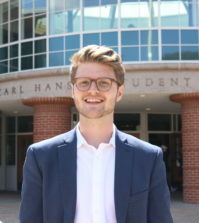 Even though he was not involved in student government in high school, Desilets always liked being a leader and knew that being involved in Quinnipiac’s Student Government Association would be beneficial for him. Matt believes that his brother is ready to take on his role as president. Matt thinks that since he and Chris will be working together in the SGA, the experience will bring them closer together as brothers. When the campaign for SGA took off on Sept. 4, Chris began knocking on doors in the residence halls and getting to know the members of the freshman class. Chris’s hard work paid off on Sept. 11, when he was voted into office with 398 votes. While Chris says it will be hard to find a time for the freshman cabinet to meet, he believes that the meetings will be easy considering how well everyone cooperates. Travis McMurray, the vice president for the Class of 2017, is excited to be involved in SGA and to work with Chris and the cabinet. 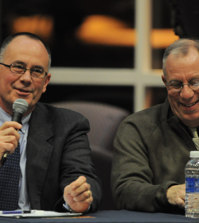 “Everyone really cares about everyone, and everyone really wants everyone to do their best,” McMurray said. McMurray feels that he and Chris will work well together. Even though it will take time for Chris to figure out how SGA works, Matt believes that his brother will easily adjust to his new position. As president, Chris made a promise that he would work his hardest. He plans to remain passionate and dedicated while he is in charge of the Class of 2017. Jordan LaCross, one of the newly elected SGA freshman representatives, believes that Chris is very positive and outgoing. Anisha Manglani, another newly elected representative, is also looking forward to working with Chris and the rest of the freshman cabinet. Chris is excited to begin meeting with his cabinet and already enjoys his position as president to its fullest extent. “It’s one of those jobs where you wake up every day, and it’s not a job,” he said.